This is a story that will stay with me for a long time. It was extremely well-written, disturbing on a number of levels, and ultimately broke my heart. I wanted to so badly for things to turn out differently. In fact, I felt such a strong desire for a different ending that I kept thinking that if I flipped back a few pages and read the end again, maybe it would change. One of the things that most excites me about this "thing" that we're doing - this literary journey we've just begun - is how it will get me to read books that I would likely never read otherwise. Like One Flew Over the Cuckoo's Nest. Never in a million years would I have picked up this book to read. And yet, here I sit, after just 19 days with it now on my "Read" shelf. *From Wikipedia: One Flew Over the Cuckoo's Nest was made into a film in 1975. 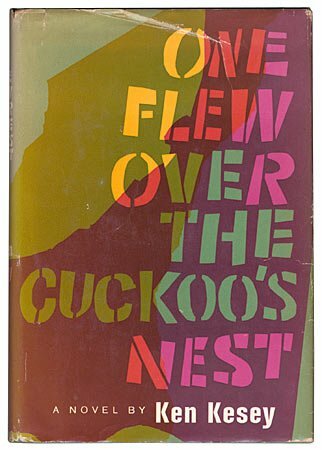 The film won all five major Academy Awards: Best Picture, Actor in Lead Role, Actress in Lead Role, Director and Screenplay) ... Now considered to be one of the greatest films ever made, One Flew Over the Cuckoo's Nest is No. 33 on the American Film Institute's 100 Years... 100 Movies list. In 1993, it was deemed "culturally, historically, or aesthetically significant" by the United States Library of Congress and selected for preservation in the National Film Registry.